Hi folks, getting a few things together ready for the nice weather. Not sure how many people choose to pack one as "standard" kit. Personally, I am a big fan of FibreLight products, including their various boarding ladders and rescue cradles - a premium product, but wonderfully light, packs small, easy to use and virtually no maintenance. Might be slight overkill on a small SIB, but useful bits of kit. Definitely not standard unless you are in an out of the water all the time. Unless it is a 'rigid' type that does not disappear under the boat as soon as you try to use it they are not the greatest thing anyway. Fitted narrow st/steel from Force 4 in Poole, Too old to climb over side with wet heavy clothes on. Which ladder did you go for? I am also to old to try and scramble over the tubes if I go in. I had one of these but a waste of time really. Preferred to use the engine cavitation plate as a step. 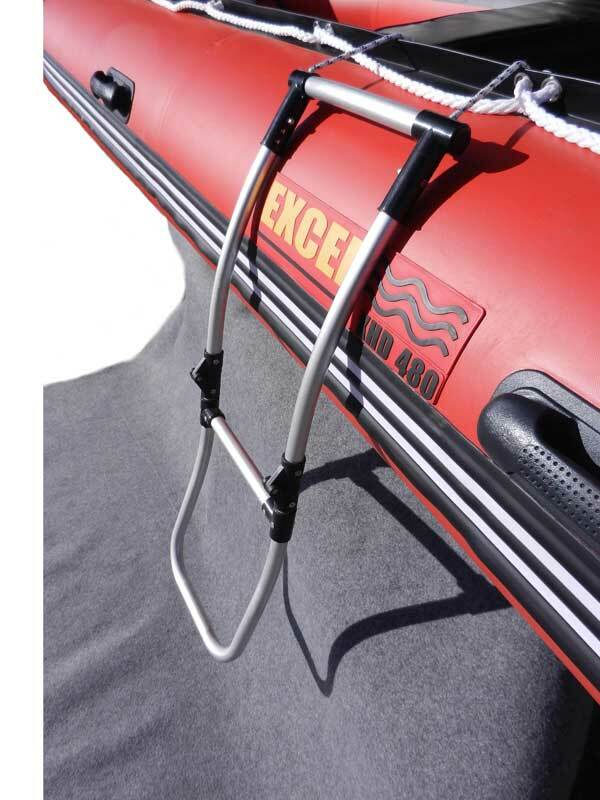 Extra narrow folding ladder from Force4 , part no 851135 £59-95. www.force4.co.uk . Fits easily on my transom only 18cm wide. Perfect if on your own and you fall overboard. What about something like this off transom?